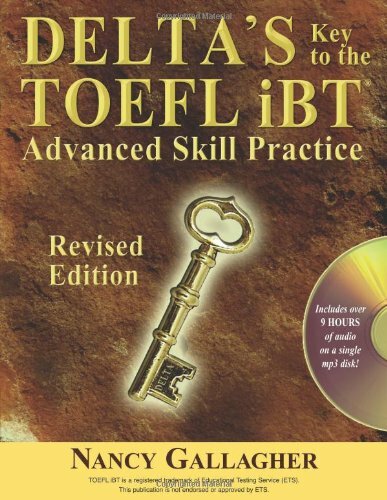 Delta s Key to the TOEFL iBT: Advanced Skill Practice is a revised and updated edition of Delta s Key to the Next Generation TOEFL Test. Since the introduction of the TOEFL iBT in 2005, there have been significant changes to some of the test questions, particularly the integrated writing and integrated speaking tasks. The new 2011 edition of Delta s Key reflects these changes with the addition of many new practice questions and updated strategies. All of the content in our new edition meets the current specifications of the Internet based TOEFL iBT. We have listened to the concerns of our users, and the new edition of Delta s Key incorporates feedback from students and instructors. Now, for the first time, we include the companion audio in mp3 format on a single CD with the book. This means the full nine hours of audio can be played on a variety of media players. The audio does not have to be purchased separately. If you have any questions about this product by Brand: Delta Systems Co, contact us by completing and submitting the form below. If you are looking for a specif part number, please include it with your message.